By now, you’re probably aware of how much footage didn’t make it into the version of Justice League that we ultimately received in theaters, thus leading to demand that the fabled Zack Snyder cut see the light of day. And while the home video release did indeed contain a few extra treats involving Superman, it’s one of DC’s other A-listers that we’re here to discuss today. We are, of course, talking about Wonder Woman, who rose up and became one of 2017’s greatest box office powerhouses. Truth be told, one would think her inclusion would’ve naturally spelled likewise success for Justice League, but that unfortunately wasn’t the case. Given that, it’s understandable as to why Gal Gadot is front and center in various examples of cover art for the Blu-ray and other formats. Tying into all this is Snyder himself, who seems to love sharing various treats from his time on the project before Joss Whedon came aboard to wrap things up. The latest example comes to us by way of his social media platform of choice, Vero, and hints at a deleted scene featuring the Amazon Warrior herself. As you can see, this is no doubt excised from a scene that didn’t make the final cut. Sure, it may be simple to figure out where other omitted shots may have ended up, but this one is admittedly a little harder for me to place among the grand scheme. Perhaps a torch-bearing Diana channeling her best Lara Croft was in regard to searching out some truth involving Steppenwolf? Hopefully the answer will one day be revealed. 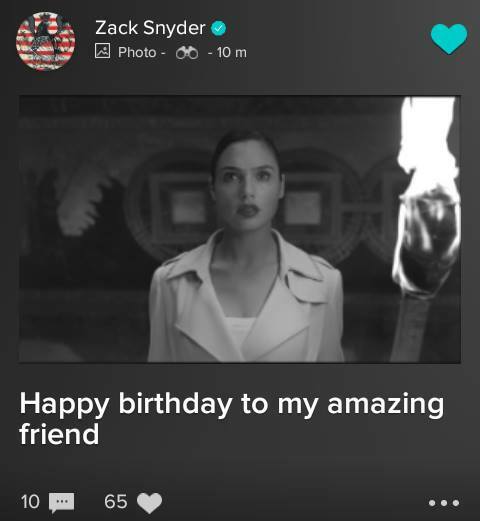 Before I get out of here, it’s worth mentioning that this was captioned with “Happy birthday to my amazing friend,” thus serving as a birthday gift of sorts to Gadot from Snyder. Maybe it’s just me, but I think each of us can appreciate this declassified Justice League goodie almost as much, right?